payment and money transfer operations. all the information about the transfer that you otherwise fill in paper-based forms. operation. Just show the cashier your QR code and they will know what to do. Depending on the type of the transaction you will either receive the cash, or pay out. Finally, a receipt confirms the transaction and stores it safely in your Tango profile. The registration process is very important. Once completed, you will no longer have to fill in any paper forms or type in your data for future transactions. All the necessary information will be fetched from the profile you create. 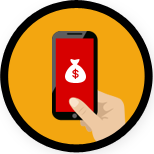 Effortlessly, Tango enables you to make a transfer or a payment operation anywhere and anytime within our network. 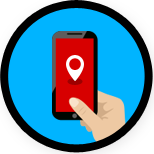 The encorporated map with all the agents and their working hours will help you avoid unecessary travel, save time, effort and ultimately money by chosing the closest and most convenient agent at any given point in time. A distinctive feature that Tango system offers for sending money transfers is a built in commission calculator. You no longer need to navigate all the websites of the money transfer companies and look for that information to compare the fares. With Tango you determine the cheapest in just a few moves. Consult the app for support in your respective country.